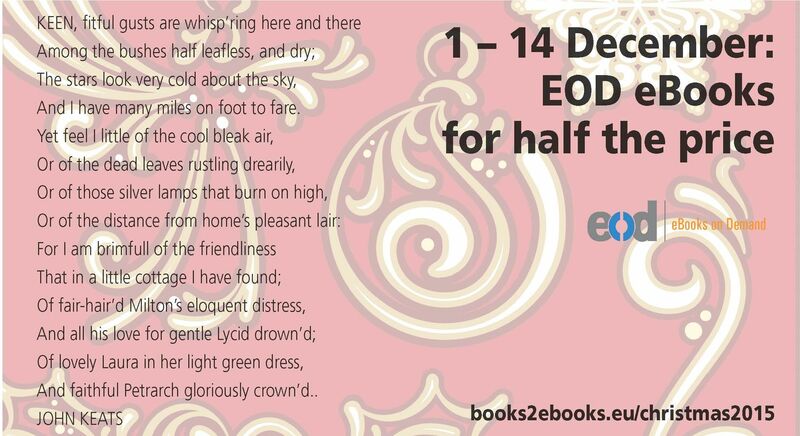 From 1 to 14 December (2015) 18 libraries offer the EOD service under the terms of a special Christmas campaign! The collections can be browsed and digitization orders submitted through the EOD search engine, online catalogue of University Library Regensburg or other online catalogues of participating libraries. University and Regional Library of Tyrol, Vienna University Library, University Library of Academy of Fine Arts Vienna, Vienna City Library, The Swiss National Library, Bern University and Central Library, Library service of the University of Strasbourg, Universitätsbibliothek der Humboldt-Universität zu Berlin, University Library Regensburg, National and University Library in Slovenia, University Library in Bratislava, National Library of Czech Republic, Library of the Academy of Sciences of the Czech Republic, National Technical Library in Czech Republic, National Library of Estonia, University of Tartu Library, National Library of Sweden, and Uppsala University Library. The campaign is organized by the University and Regional Library of Tyrol (University of Innsbruck) and National Library of Estonia. The libraries reserve the right for exceptions in special cases. See the Terms & Conditions after clicking the “digital on request” button in the record of the desired book.